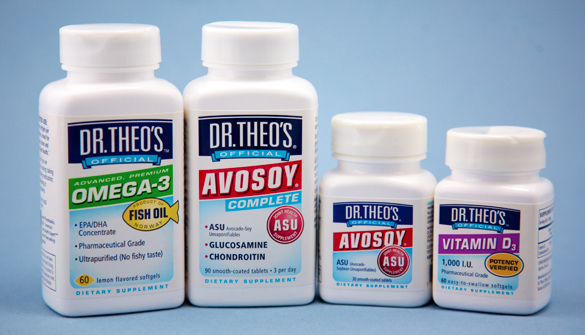 Dr. Theo (Jason Theodosakis, MD, MS, MPH, FACPM) is the leading authority in joint health, and the creator of a new line of dietary supplements, 10 years in the making. After years of evaluating and calling out substandard and mediocre products, Dr. Theo became concerned that many people thought they were saving money by buying discount or “store” brands (or poor quality name-brand products.) Sadly, many ended up needing dangerous drugs or surgery – they didn’t know the products they were using were deficient in one way or another, no matter what the label promised. What was the solution? Give people the choice of products with the most advanced ingredients; the finest production and quality assurance one can buy, anywhere. The result – products he’s be proud to take himself; give to his patients, and to his family. The results of these laboratory analyses are actually available for public review. You can view the exact contents of the lot number for the bottle you purchase. Each AVOSOY® product contains the revolutionary supplement, ASU (Avocado/soybean unsaponifiables). Uses only 100% shellfish-free, vegetarian glucosamine and cow free, USP grade chondroitin (in the AVOSOY® Complete). Each product contains additional special joint co-factors to assist cartilage growth and repair. Using dietary supplements, such as AVOSOY® Products are a key part of this program. They contain ASU (avocado-soybean unsaponifiables) and are available without a prescription.